Share your loving spirit with the world by wearing this unique Down Syndrome Photo T-shirt at your next Buddy Walk Event. With your help, you can spread awareness. Although October is Down Syndrome Awareness Month, you too can show that you love, support and understand Down Syndrome by wearing this Personalized Down Syndrome Awareness T-shirt. Our Personalized Down Syndrome Photo Buddy Walk Shirts are available on our premium 100% cotton sweatshirt, machine washable in youth sizes XS-L and adult sizes S-3XL. Includes FREE Personalization! Upload your favorite digital photo below. Please don't send any photos in the mail, digital photos only. Please include a description of the photo. (ex. Little Boy in Orange Smiling). 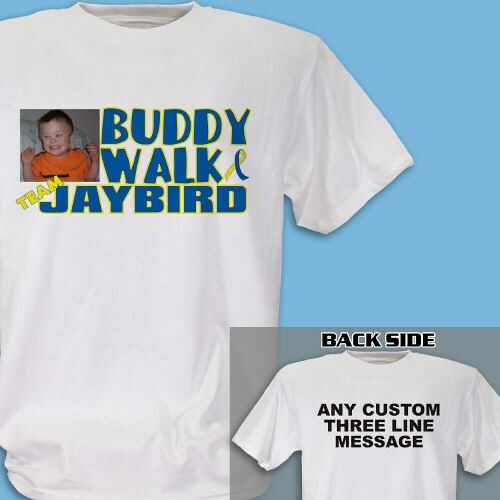 Personalize your Buddy Walk Photo Shirt with any team name: (ie Jaybird) and any three line custom message personalized on the back of your shirt. Love the shirt. Very food quality. Additional Info Our Down Syndrome Awareness Shirts and Walk Gear are great for fundraisers, walks, awareness campaigns, and gifts. Select from our wide variety of products designed and priced to make it easy to raise funds, create awareness, and motivate volunteers. Be sure to also take a look at our Personalized Buddy Walk Water Bottle and our Hope Love Cure Down Syndrome Awareness Key Chain to help spread awareness every day.